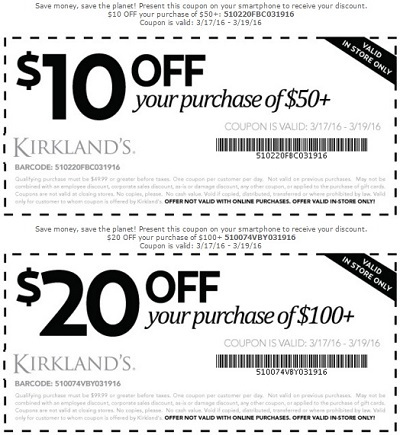 Save Some Green with these St. Patrick’s Day Specials at Kirkland's store locations in the U.S. You have 2 ways to save. First one: take $10 off your purchase over $50. Second one: take $20 off your purchase over $100. You must print coupon to receive the offer. You can also enjoy this offer online with promo codes. Enter promo code LUCKY or CHARM at checkout. Source of the information is Kirkland's. For more details visit your nearest store location. Offer expires 02/19/2016.